The sales associate looked at me with her head cocked, eyebrows raised and conceded the point. I’ve had the same small, brown glasses frames since 2011. I chose them not long before the twins were born in that end-of-pregnancy flurry of getting everything done before life changes irrevocably. Dentist? Check. Glasses? Check. In the exam room the optometrist looked up, surprised, from his chart. “This says I haven’t seen you since 2013?” he asks. “And you bought contacts then? How often do you change them? Do you have any left?” He voice conveys incredulity. The answer seems to satisfy. In the sales room, a young woman follows me around among the frames. I ask her what’s “in” these days and she tells me bigger plastic frames. “What are you looking for?” she asks, calm and detached behind her half-framed lenses of dark blue metal. Her dark hair is long and perfectly straight. 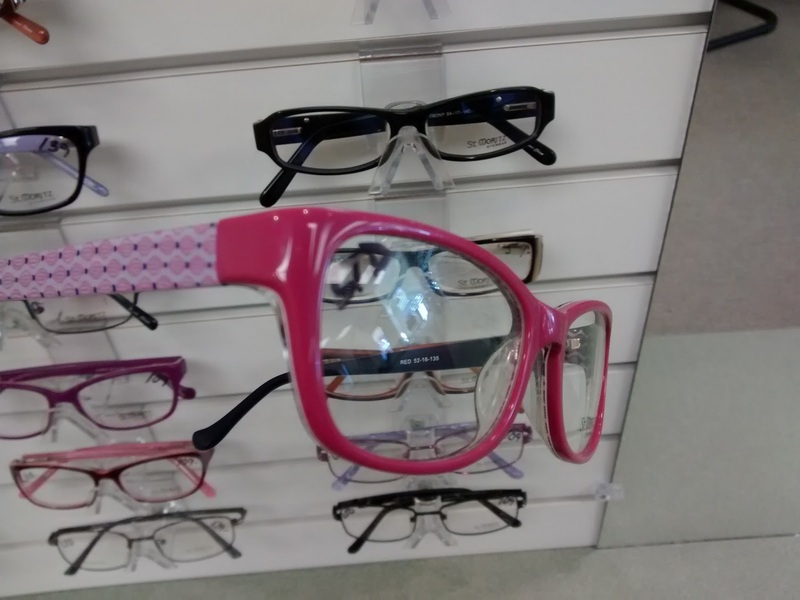 What I really wanted, before I even walked in the door, was pink glasses. I wanted happy glasses, but I wasn’t sure I dared get them. What if I made a mistake? I feel like a failure when the optometrist pulls up letters I can’t read. Blinking, I watch letters flip and wiggle like so many small black ants waving their legs. I make random guesses, occasionally upping my odds by offering two answers at once. “Um, I think it’s an E . . . or a P?” One line I cannot read at all. The exam room is so strangely intimate, dimly lit, with the optometrist scooting around on his rolling stool, peering into my eyes with a little light that he moves in circles like a magic wand. My left eye, weak as ever, has worsened again, but, good news, I’m not yet in need of bifocals. In the end, I whittle it down to two pairs, identical in shape, one navy blue and the other a cheery magenta. Both frames have funky squiggly patterns in complementary colors along the temples. Both pairs are cute, but the blue look better on me. Still, I hem and haw. A second associate is called over. She put the glasses on her own face for me. “See,” she says, “these blue ones kinda blend in but with the pink ones, the frames are all you see.” I see what sees and know she's right. Then she adds a third pair into the mix, shaped like the others, but in a deeper shade of purple. "These make a nice compromise," she says. But her well-intended suggestion only further confuses things for me. I circle the room, I sit again and slip frames off and on. “I’m turning forty in a year,” I tell the original associate, “maybe these will be my mid-life crisis glasses.” I'm only half-joking. Do I like the pink glasses or do I only like the ‘idea’ of pink glasses? “You’ll want to think about the clothes you wear too, not just what you have one today,” the second woman adds. The younger woman agrees. “Pink goes with everything in my book,” she says. I find her patience endearing. I apologize for taking so long. Then, finally, “I want the pink ones,” I say, scrunching my face up as if to offer an apology. “I knew you did,” she says. I'm super excited to be joining with Andi Cumbo-Floyd and Shawn Smucker to organize a weekend writer's retreat this summer at God's Whisper Farm in the beautiful mountains of Virginia. Visit Andi's website for more info! I'm glad you got your pink glasses! The last time I went to get glasses, I wanted plain, with no ornamentation, but it was impossible to find. ha. I had to get a little bling. But I adjusted. :) I do remember Sally Jesse Raphael. It's always the red glasses that I remember the most. Yes, the red glasses :) Yeah, I don't like ornamentation on the sides. Such a great post to read, probably even more so because I, too. had a recent trip to the eye dr. Happy Birthday! I am glad you went with the pink. And may you see ever more clearly what God has for you in the days ahead to see. Blessings! Your post reminds me that it's time I had another eye exam. I'm glad you went with the pink glasses. Except for when I was a child, I've always had pretty plain glasses without much color. I just might go for some color next time. :) Blessings to you, Kelly! Kelly this makes me smile in so many ways! (yes, I remember SJR from television; you're not the only one). On my way to your Facebook page--I'll bet you look adorable! So glad that you went with the pink frames -- and I do remember SJR and her red frames. This is all making me think that it's time for me to make a statement with my next glasses. I cringe every time I go to the eye dr. over that horrible hovering intimacy . . . and my complete inability to remember which view is better. Somehow my answers always peg me for an indecisive oblivious soul. just love your new glasses!! So glad you went for the pink ones, more edgy and fun! We all need a bit of the out of the ordinary, and nothing like a fun pair of glasses! My eyes are getting pretty bad lately too. .you're reminding me it soon will be about that time to deal with it.. my right eye is really weakening..gosh, what kind of glasses will I get next. I surely will think of you!